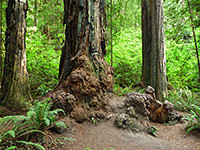 The short Stout Grove Trail loops around what may be the most photogenic section of the forest in Jedediah Smith Redwoods State Park, since the land is flat, and largely free of undergrowth and fallen trunks; instead the ground between the trees is covered only by a low, even carpet of ferns, through which rise numerous healthy, similarly-sized, old-growth redwoods, quite well separated. The limited understory and lack of much dead wood is due to periodic floods along the Smith River, which flows close by just to the north and provides the only background sounds - the grove is just far enough away from US 199 to escape all vehicle noise, something always noticeable on the trails that start along the highway. 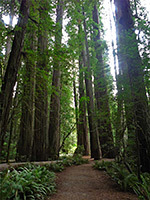 The redwoods in the Stout Grove seem rather greyish in color, not the rich red seen in some other locations, though the trees are still very impressive and usually nicely lit by the sun (especially in late afternoon), since this location is quite far from the ocean and not greatly affected by fog. Despite being located along a narrow, partly unpaved side road (not suitable for RVs), the grove is relatively popular, and yet never too busy, perhaps as parking is limited and the loop is quick to walk so most people don't stay very long. 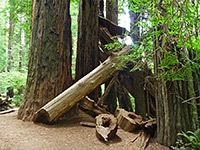 Those wanting a longer hike can choose from three linked paths - Hiouchi Trail alongside the river (connecting with the Hatton Trail), Mill Creek Trail to the southwest and Little Bald Hills Trail to the southeast. 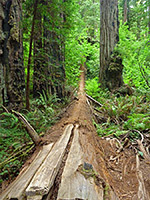 Access to the Stout Grove is via the mostly unpaved Howland Hill Road, a journey of 7 miles from Crescent City in the west or, the usual approach, 2.7 miles from US 199 in the east. From this direction, the road crosses the Smith River on a 1950s bridge, passes the enclosed lower section of the canyon of the South Fork River, and an old covered bridge soon after, then enters a small residential area which is bordered on the far side by the edge of the redwood forest; past here the road narrows to a single lane and becomes unpaved. There is a small side track/turnaround quite soon and then just occasional passing places, with a little more space around the junction with the short, paved spur to the grove. This leads to a parking area with room for about a dozen vehicles. 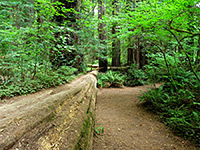 From the parking area, the wide, paved path descends slightly to the flat forest floor and to the start of a 0.4 mile loop, which encounters many large, undamaged redwoods plus just a few fallen trunks and branches, all surrounded by rich green ferns, an environment rather different in appearance to the great mass of undergrowth and moss-covered fallen branches that characterize most other parts of the forest, away from the cleansing reaches of the river floods. At the far side of the loop there is a junction with a lightly used connecting path to the Little Bald Hills trailhead, along Howland Hill Road. 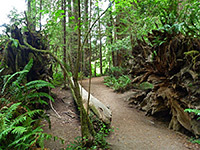 The north section of the Stout Grove loop runs close to the river and only about 20 feet above, though the water is out of sight due to a thin band of bushes along the forest edge, and a strip of grassland beyond. The river can be seen by walking a little way along the Hiouchi Trail, which joins from the northwest, close to the start of the loop.